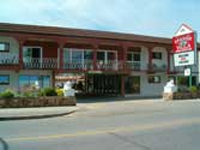 The Palms Hotel sits on Nanaimo's primed Waterfront, and is only a few blocks from BC ferry and the floatplane terminal. The hotel component has 22-luxurious suites over-looking a multi million-dollar marina, a destination restaurant and a day spa. The hotel rooms are located on the 2nd, 3rd and 4th floors of a residential tower. We offer modern hotel rooms and presidential suites and in addition two bedroom "homes" complete with fully equipped kitchens featuring Kitchen-Aid appliances. Spanish Villa Resort, located across from the sandy beaches of beautiful Okanagan Lake, awaits you and your family, whether on vacation or business. Situated only minutes away from the convention centre, arena, tennis courts and children's play park and close to golfing and the downtown area, this resort is also conveniently located within steps of some of Penticton's finest restaurants.